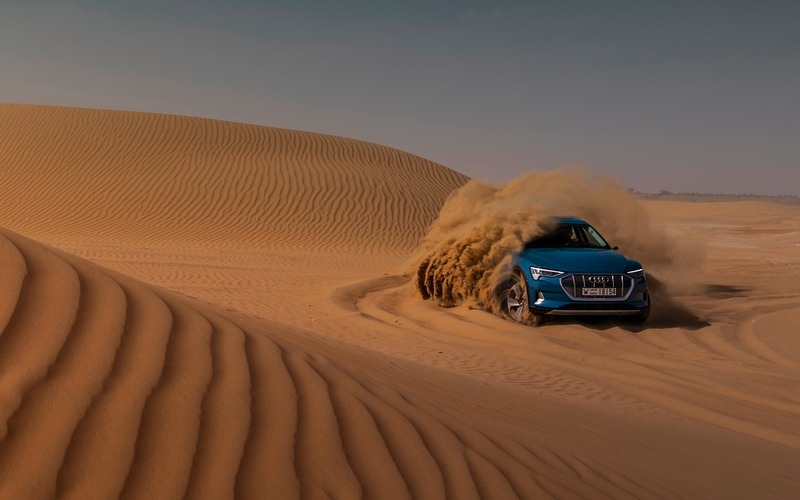 ABU DHABI, United Arab Emirates – Over the past three years, Audi's electric e-tron quattro SUV has gone from a concept vehicle to a production model. We’ve already written a number of articles about its evolution, including its world premiere in San Francisco and our test drive of the prototype in Namibia. In Drive mode, the two electric motors serve up 265 kilowatts, which is equivalent to 355 horsepower. In Sport mode, this increases to 300 kilowatts (402 horsepower), allowing you to sprint from 0 to 100 km/h in 5.7 seconds if you engage launch control. This is a very respectable time considering that the e-tron quattro weighs 2490 kg—almost two and a half metric tonnes! When we set out, the vehicle posted 315 km of range, not 400 as indicated by the worldwide harmonized light vehicle test procedure (WLTP) test. Perhaps our 95-kWh battery—located in the floor and weighing 699 kg—was not fully charged. But after nearly two hours of blasting down the highway at 140 km/h, our energy consumption hovered just under 30 kWh per 100 km, which means that our total range would have been closer to 300 kilometres. That being said, the air conditioning was on to counter the blazing sun and 25°C temperature. Plus, we tested the vehicle’s acceleration and pick-up, which used up more energy than smooth driving at a constant speed— especially a speed below 140 km/h. During the 12-km ascent up the winding mountain road at Jebel Hafeet, the e-tron quattro proved surprisingly agile, something we didn’t expect from an SUV that weighs nearly two and a half metric tonnes. 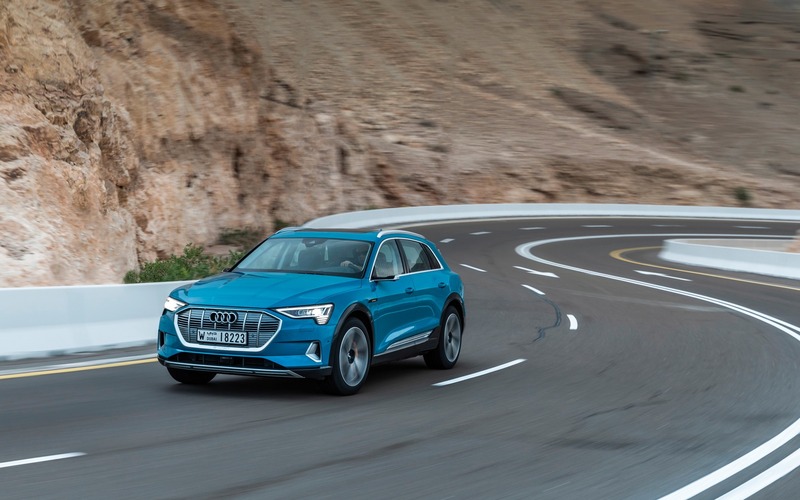 It understeers when pushed in curves, but the e-tron quattro’s electronic all-wheel drive system automatically applies the brakes on specific wheels to bring the vehicle back into its lane, all within 30 thousandths of a second. The e-tron quattro's electronic all-wheel drive is much faster and more efficient than what you’d find on an SUV with a conventional combustion engine. What goes up must go down again. The descent was another opportunity for us to assess the vehicle’s regenerative braking and energy recovery capabilities. During deceleration, the electric motors work like dynamos to recharge the battery, with more energy recovered when the brakes are applied. But if you brake more intensely, pushing the deceleration force past 0.3 G, the hydraulic brakes take over to slow down and stop the vehicle. The e-tron quattro’s regenerative braking is very effective, but not to the point where you can drive with a single pedal. By the time we made it back to the bottom of the mountain, the vehicle had recovered 6 kWh of energy. 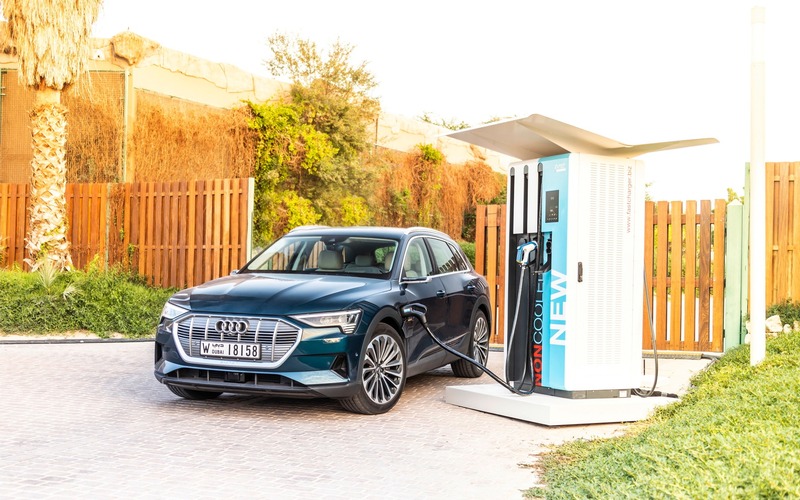 There are a number of ways to charge the e-tron quattro. In North America, it takes 10 hours to achieve a full charge when you plug the vehicle into a conventional 220-volt charging station that delivers 9 kilowatts. But you can get to 80% in 80 minutes if you use a 50-kW fast charging station, or 40 minutes with a 100-kW charger. Meanwhile, drivers in Europe can get an 80% charge in just 30 minutes using a 400-volt (150-kW) station. 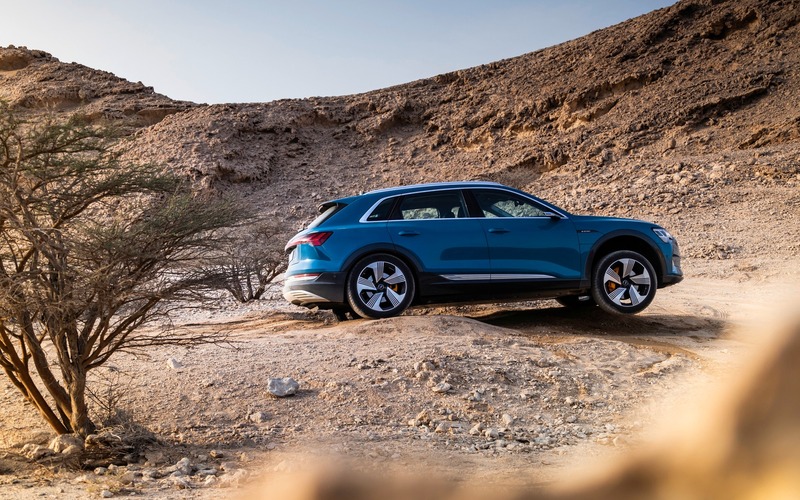 Since the e-tron quattro comes standard with an air suspension, you can raise the ground clearance to get over rocky passages and other obstacles with relative ease. Even though it wasn’t purpose-built for off-roading, this electric SUV can skillfully take you off the beaten track, provided it’s not too extreme. The e-tron quattro is 4900 millimetres long, 1940 millimetres wide and 1620 millimetres high. This means that it’s as long as the Q7 and almost as tall as the Q5. How versatile is it? It offers 605 litres of cargo space when all seats are up or 1755 litres with the rear seatbacks folded down. 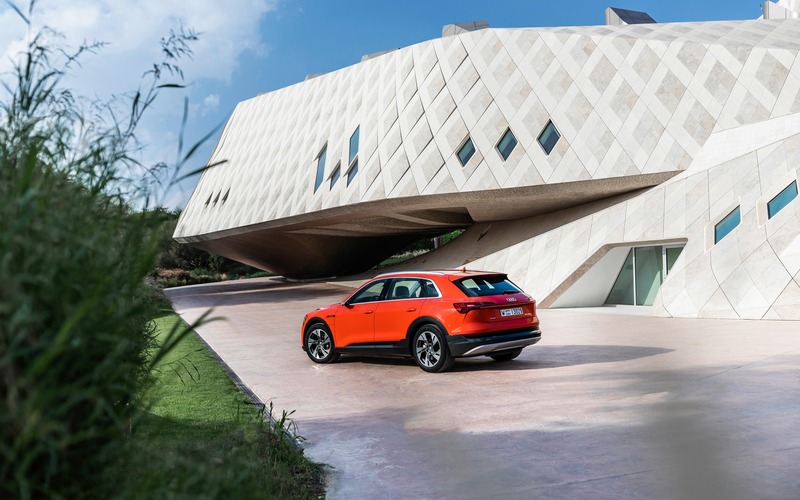 The cabin is spacious, providing generous head- and legroom in both front and rear—thanks in part to the fact that, unlike a conventional SUV, the e-tron quattro doesn’t have a transmission tunnel running through its middle. With various colour touchscreens—five in all—the high-tech dashboard is aligned with the brand’s other recent models. The first display replaces the traditional instrument block. There are two more on the centre console: one to control the infotainment system and the other to control the A/C. The remaining two are located inside the doors and display the images captured by rearview cameras. This shift away from conventional sideview mirrors reduces the vehicle’s drag coefficient from 0.28 to 0.27 and increases its range by three to six kilometres, according to the engineers who developed the new system. Unfortunately, the virtual mirrors have not been approved for use in North America, which means that e-tron quattro units sold here will be equipped with conventional side mirrors. 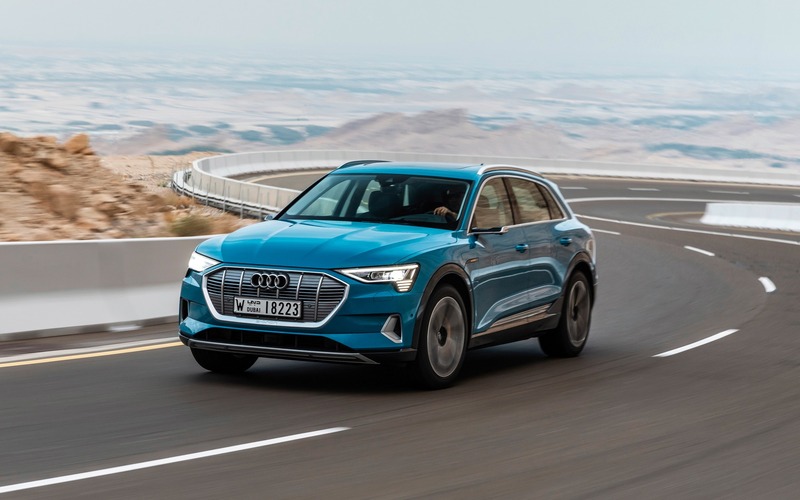 Two versions of the 2019 Audi e-tron 55 quattro SUV will be available in Canada: the Progressiv and Technik. They’ll start at $90,000. This price will include two years of unlimited use of Electrify Canada’s charging stations and a free service package. It also includes an 8-year/160,000 km warranty for the battery. Interested buyers can express their interest by leaving a refundable $1,000 deposit at an Audi dealership or on the Audi Canada website. So far, we’ve only tested the e-tron quattro in warm weather, which leaves a lot of question marks about its performance and driving range in a northern climate like ours. However, the model’s engineers pointed out some of the vehicle testing was carried out in winter in Scandinavia, and that in these conditions its range was close to 250 km. Though they also included the caveat that energy consumption is related to several factors, including driving habits. Clearly, we won’t be able to draw definitive conclusions until the media is able to test the e-tron quattro in real-life winter conditions. 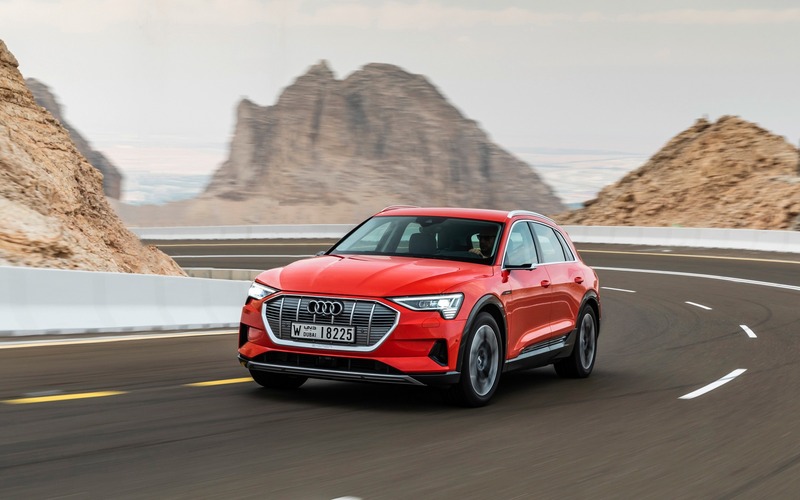 In a nutshell, the 2019 Audi e-tron quattro is a conservatively styled vehicle that boasts impeccable assembly and interior finish, as well as advanced technologies and skillful handling. It certainly looks promising, but we’ll reserve our final judgement until we can test the e-tron quattro on Canadian roads in winter. One thing seems sure: given Audi’s serious approach and Volkswagen Group's recent announcement that the next generation of combustion engines will be their last, the shift to electric vehicles is well underway. 8/10	We recorded approximately 30 kWh per 100 km, but highway driving speeds reached 140 km/h. 9/10	A very comfortable ride thanks to the standard adaptive suspension and excellent soundproofing. 8/10	0 to 100 km/h in 5.7 seconds in Boost mode using launch control. 9/10	All systems are controlled via colour touchscreens with haptic feedback. Apple CarPlay integration comes standard. 8/10	The e-tron quattro is a heavyweight (2490 kg), but it offers 50/50 weight distribution. 8/10	A technically advanced vehicle.